Hunt's Pier, Wildwood, New Jersey ~ The History Girl! This image is actually of the second incarnation of an amusement pier constructed on this site. The original venue, the Ocean Pier (also known locally as the Funchase Pier), was constructed in 1905. Tragedy struck the popular attraction, during World War II, on Christmas Eve 1943. A night watchman fell asleep while smoking a cigarette and the entire pier, constructed mostly of wood, went up in flames taking the life of the watchman and a firefighter. The fire was so spectacular and the explosion so loud, there was fear and speculation that a German submarine had shelled the pier. A new amusement complex was not built for quite some time, due to wartime limitations imposed on construction materials. Hunt’s Pier finally debuted in the spring of 1957. Determined not to let history repeat itself, Hunt had the pier’s deck and pilings constructed entirely of concrete reinforced with steel rods. Advertised as an “Oceanic Wonderland,” it was more Disney-like and theme oriented than its competitors. Hunt’s Pier, as we knew it, will never be the same. It was sold in 1985 and passed through several hands until the Morey Organization became owners in 1999. 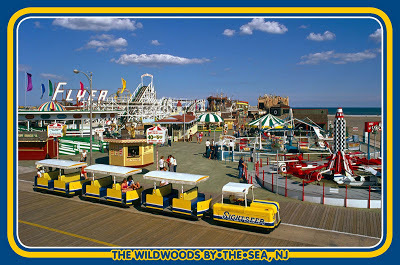 The “Flyer” roller coaster, the “Golden Nugget”, the “Keystone Cops” and the “Pirate Ship Skua” have all been torn down. Although the pier stands today and is structurally sound, none of the attractions pictured on the deck are present at this time. Douglas Hunsberger is a freelance photographic artist, writer, and producer of “Wildwood Daze – The Giant Postcard Exhibition” for the Doo Wop Experience Museum in Wildwood, NJ. He is best known for his postcard images and the extreme measures he endured to get the perfect shot. From seagoing safaris to helicopter rides with the doors removed to climbing to the top of amusement rides – there was virtually nothing off limits!